Two years ago I showed you the first stage of this project. 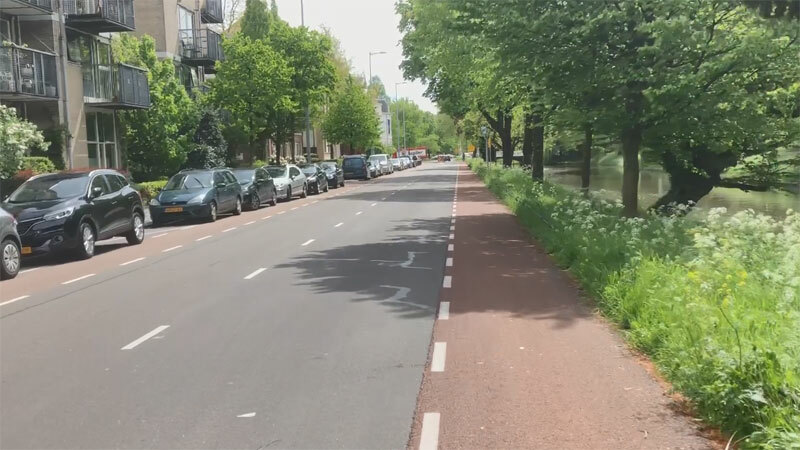 The streets named Maliesingel and Tolsteegsingel were transformed from a main road with narrow on-street cycle lanes to a cycle street with two metre wide cycle lanes in smooth red asphalt on the outside of the street. The rest of the road space in the centre (2.5 metres wide, or just a bit wider than one car) got a brick surface and is meant for motor traffic in both directions. a design that fits the grandeur of this historic area and increases the quality of this space for people. 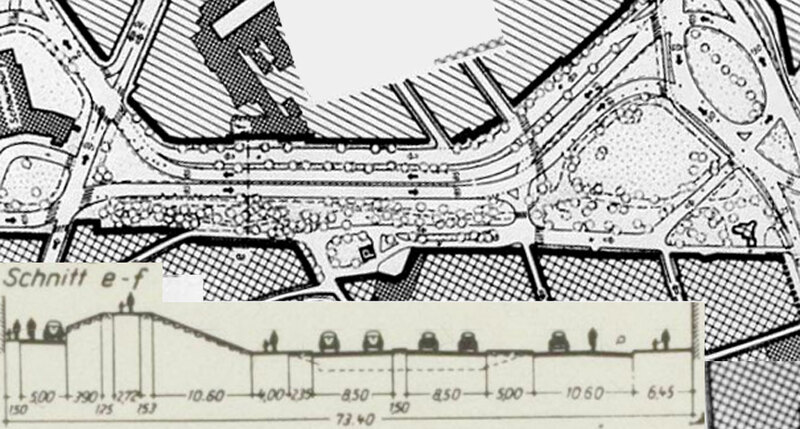 Stark differences between the traffic plans from 1958 and 2016. In 1958 this was the only plan there was; it was all about cars. In the 2016 plan this is the fourth map. There are first maps for the pedestrian network, the cycling network and the public transport network. The car network is mentioned last. Although much of the projected roads in 1958 were indeed built, the number of main roads – especially inside the inner ring – has decreased. The city centre can still be reached from all directions but you will have to go out the same way you came into the city. Through traffic is virtually impossible and there is no ring right around the historic core. The 2016 plan shows the desired situation for 2025. 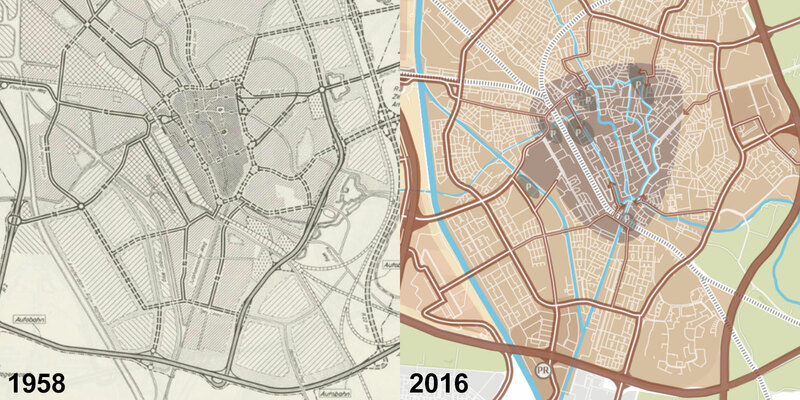 Pictures left: Plan Feuchtinger, right: Mobilityplan Utrecht, 2025. German traffic engineer professor Feuchtinger used the full width between the buildings of 73.4 metres for a 4-lane main road and two front roads on either side in his 1958 traffic plan. The canal would have to be filled in for this plan. Note the width of the traffic lanes; 4.25 metres! No infrastructure was planned at all for cycling. This plan never materialised on this location. The same location. This is the redesign of the street from 2018 as it was constructed now. Picture City of Utrecht. Cross section of Maliesingel in the new situation. It is clear that this street was not designed with the car as its main user. Picture City of Utrecht. Today’s goals couldn’t be further from the plans the city council had 60 years ago for exactly the same area. At that time the city wanted to “upgrade” it by filling in the waterway and making this a four lane road. Utrecht had hired a German traffic engineer, professor Feuchtinger, who drew up a traffic circulation plan in 1958. Traffic counts had shown the bicycle was by far the most important means of transport in the city at the time and the professor had quietly asked the council if they were really sure they wanted to design for the car and not the bicycle, but that was confirmed. These plans were met with a lot of resistance of many people in the city and the plans were revised several times since 1958, but in the end they were never executed. At least not on the east-side of the city centre. The motorway in the place of the city moat was built on the west-side, but there it is in the process of being completely erased from history. (See my earlier post). 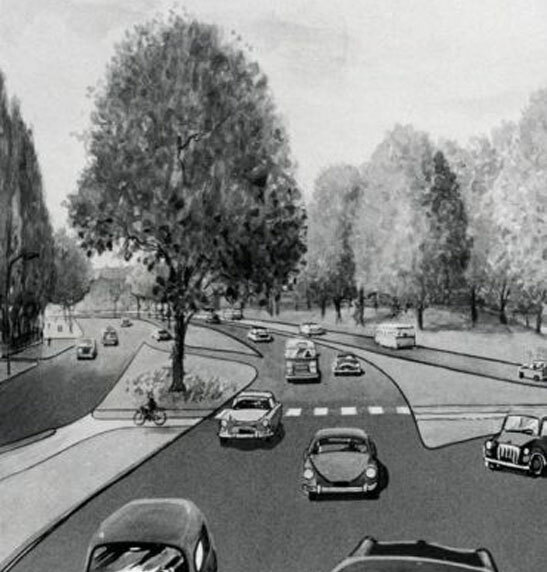 Rendering of the 1958 traffic plan for the city centre ring. The city would have looked a whole lot different than it does today or than it ever did. This plan was never executed. It is interesting that there was so much emphasis on the trees in this picture. It is almost as if that was done to divert your attention from something else… Picture Utrechts Archief. The before situation in May 2018. This was a 50km/h road with on street cycle lanes. Note that the cars are almost all parked with two wheels on the cycle path. They were too narrow for today’s standards. There was a centre line before on the space for cars. This indicates that it is a 50km/h road. The after situation in November 2018 on the same location. Note that the road was narrowed so much that there is now room for an extra footpath on the right hand side. Cars now park on a designated area of the sidewalk. That means that when no cars are parked that area of the street becomes footway and not roadway. The cycleways are 2 metres wide. The central part in bricks is 2.5 metres wide and is for cars in both directions. Cars may invade the cycle path to overtake people cycling or to pass other cars, but only when there are no other people cycling there. The first part of the current reconstruction was also met with a lot of criticism. People feared there would be too much motor traffic relative to the number of people cycling and that would negatively influence safety and convenience for cycling here. After the city went ahead with the construction the first stage of the project was therefore evaluated. The city wanted to know if it had to possibly adjust the plans for the further stages and it also wanted to learn from this project for future projects. Different consultancies were hired for the different tasks. It would go too far to get into every aspect of the investigations but it is interesting to see what people cycling had to say. Investigators stopped people passing on a bicycle. Of those people 99 were prepared to answer a questionnaire. Of those people 97 were cycling alone, two people were cycling side by side. They generally had a positive opinion of the redesign, 77 of the 99 people rated the street with 7 (out of 10) or higher. The perceived speed of motor traffic and the safety during overtaking are points that deserve further attention. Vehicle counts and speed measurering of motor traffic on the first part of the reconstructed streets. The reconstruction took place between May and November 2016. Figures from the evaluation report published by the city of Utrecht. The before situation in May 2018. Note how close the asphalt is to the tree in the grass on the right hand side. There were refuge islands to cross the street here for pedestrians and to make a left turn. The same location in the after situation in November 2018. The same tree is now a long way from the street. A footpath was constructed between the road and that tree. 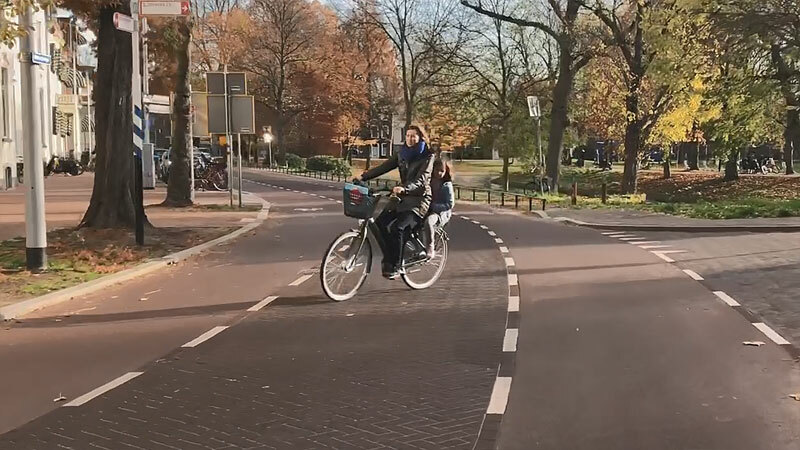 You can clearly see the difference in surface of the cycle lanes (smooth brownish red asphalt) and the central carriageway for motor traffic in brown bricks. That there is no centre line is an indication that the speed limit is now 30km/h for motor traffic. 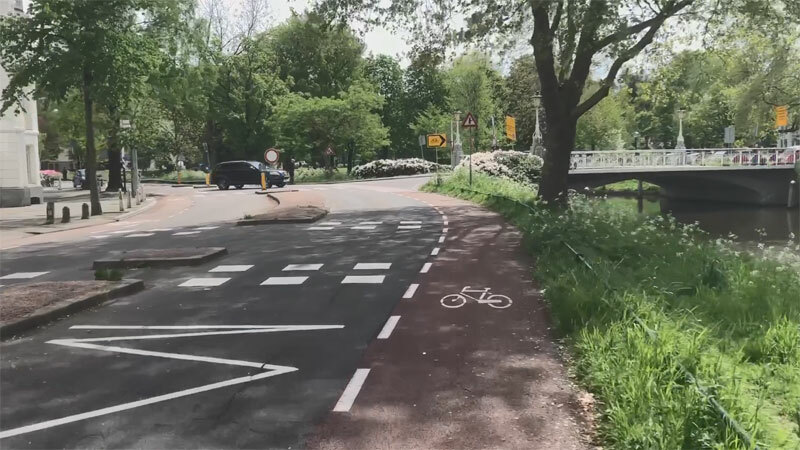 We have successfully changed the character of the route from a road with an important traffic function to an area that invites people on foot or on a bicycle to linger. Most important is now the cycle route for through cycle traffic with much more interaction between all road users. 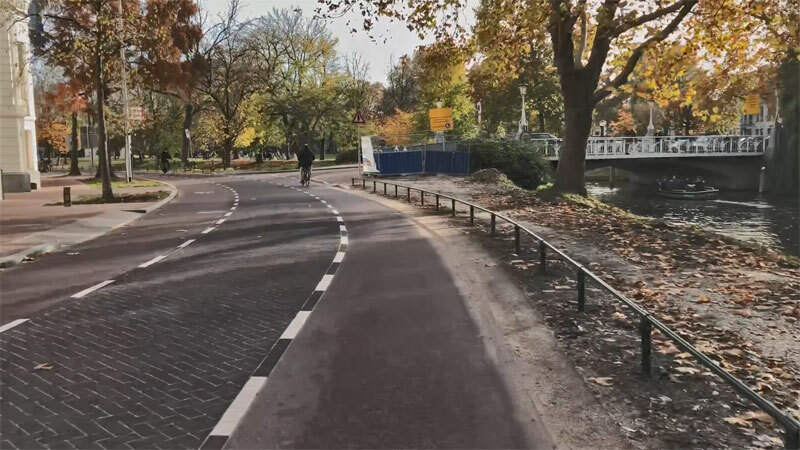 The reconstruction led to a significant increase in the number of people cycling, a strong decrease in the number of cars and an importantly lower speed. Indications that the area is undergoing a gradual transformation from traffic road to an attractive urban space for people. 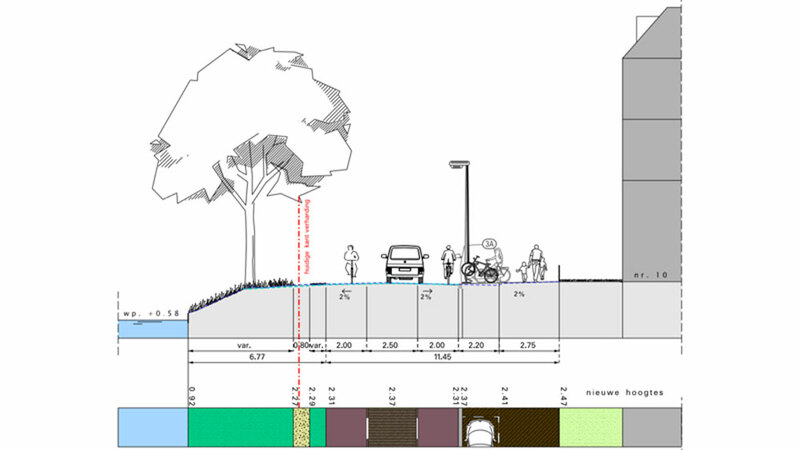 The street design supports the desired behaviour where people look out for other people more. The street is objectively safe, although not all road users feel subjectively safe. Some people cycling feel that car drivers do not always overtake safely. The way car speeds are perceived plays an important role here. The lowered speed limits have an effect, but the speed of motor traffic is sometimes perceived as too fast. Especially during busier times the new traffic situation requires more attention and an adaptation of the speed from road users. Following these conclusions the city will try to further nudge car drivers to take a different route and when they do use this street to make them adhere to the lower speed limit better. The findings did not lead to a change of the further parts of the route. This change in behaviour is not easy to accomplish, not even in the Netherlands. Car drivers do not give up their position easily. That this design works here is only because of all the other measures to rearrange the traffic order in the city. This design is not something you can implement when the car is still king. The second part of Maliesingel was reconstructed from May to November 2018 and the third stage in Wittevrouwensingel is currently under construction. The whole project is expected to be finished in March 2019. Before and after video with a ride in both directions. I was a bit late filming the before situation. The reconstruction had already begun. More bicycles, less cars. That should be the slogan for the world. Actually, more bicycles, no cars is a lot better. I like the new footpath along the canal side. 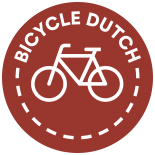 5) It also puts people on bikes on the side of the driver’s door, between the door and the traffic lane, increasing the risk of dooring. The cycle lanes are wide enough to avoid dooring, but not when riding side by side chatting, with a car in the car lane. 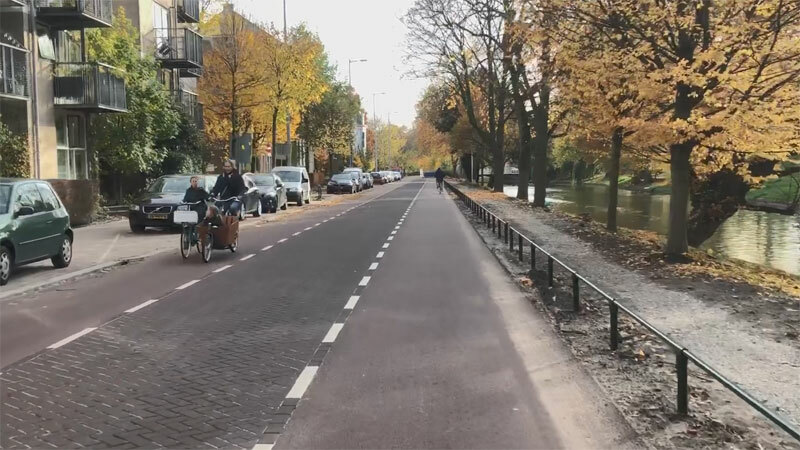 This entry was posted on 4 December 2018 by Bicycle Dutch in Original posts and tagged before and after, history, urban design, Utrecht.